Diamonds can become smudged and dirty throughout every wear even if you are careful about what you do when you wear your jewel. The natural oil in the skin, soaps, lotions, and other materials can cause a film to develop on a diamond. The engagement rings tend to be a prized possession, not only because they are costly, but they are also valuable because of the various emotions and sentiments attached to these rings. It is very difficult to make sure that the diamond rings stay in their shiny and sparkly form all the time. They tend to get dirty when they are worn on a daily basis. This is why you need to clean them on a regular basis. Here is a look at two ways to clean your engagement rings; one is to clean them in your home, and the other one is to get them cleaned professionally. Many of us have diamonds or other jewelry that may need to be cleaned. Our day to day activities cause these items to become dirty and in need of some care. Lotion, soap, and skin oil can cause a film to appear on your jewelry. Even if you don’t wear your ring every day, it can gather dust in storage. In general, the ten steps described here will work well for most types of diamonds rings. Pour some detergent into the warm water and mix well. You merely need to employ a minimal amount of soap to make the solution slightly soapy. Place your diamonds in the soapy water to soak for around 15 minutes. This gives sufficient time for just about any built-up grime to break down and allows for easy removal. Fill another bucket with hot water and add a tiny amount of ammonia-based glass cleaner solution. Never use chlorine (this is harmful to your ring) based cleaners because they could chemically react with some metals in the rings. After 15 minutes in the detergent bathtub, remove your rings and stick them in the next pot which you prepared with the glass cleaner. Take away the rings from the cleaner solution and begin cleaning it with a brush with soft bristles. Clean all edges of the diamonds by brushing lightly with the soft brush. Since mud accumulates typically at the ends and the trunk of the band, you might like to give these areas a perfect scrub. If the earrings have a prong-based kind of setting, take care not to clean vigorously as the bristles get stuck in some of the prongs and can loosen the stone when you apply increased force. Now, use clean water to rinse out the jewelry. If you are rinsing from the kitchen sink basin, be sure you put in a filter to the drain to avoid dropping your rings by accident. Having done this, there is one more important step to take, and that involves methylated spirits. Place the ring in a small recipient containing some methylated spirits for 15 seconds, then wiggle it a bit within the solution to create movement. The diamond ring is then dried using the kitchen towel or tissue again. The methylated spirit will revive the brilliance of the metal, and it will again shine, and it will remove any ‘haze’ effect left by the liquid detergent, giving the diamond that extra sparkle it deserves. If the diamond on the ring you are treating has been neglected for quite some time, soap and water may not be sufficient to restore the stone’s brilliance fully. In this event, one very effective option is an ultrasonic machine. These contraptions, which can be found in most jewelry stores, are designed specifically for jewelry cleaning and will clean almost any ring using extremely high-frequency to generate a vigorous cleaning motion. Be careful though. These machines can be particularly dangerous if proper safety precautions are not dutifully observed. A diamond is very durable and reliable, considering how delicate and beautiful they are, and they can last a lifetime and beyond if they are cared for properly. Caring for a diamond is fairly simple, and there are just a few things to keep in mind when caring for your precious stone. Different cleaning options will help keep it as sparkling and brilliant as the first time you wore it. There are some cleaning procedures that you can do at home on a regular basis, but you can also return to your jeweler where you made your diamond purchase and ask for a professional cleaning. This may be included in your warranty agreement at no charge. It is also wise to return to your jeweler at least once a year to have your diamond cleaned, and also have the setting checked to make sure your diamond is still secure. When you buy diamond jewelry you will find after time the brilliant shine will begin to fade. This happens due to the oils in your skin, lotions you use, and other things that come in contact with it. There are many ways you can clean your jewelry to make it look as brilliant as the day you purchased it. These ways include self-cleaning, professional cleaning and ultrasonic cleaning. Clean Your Diamond Ring by Toothbrush. One of the best ways to clean your diamond jewelry yourself is with a soft bristle toothbrush. Use a mild soap and water to scrub. All you have to do is make a mild mixture of soap and water full of bubbles. Place your jewelry in the water and let it soak. Then you will scrub it softly. If you have a diamond watch that you cannot get wet, you might consider a professional cleaner for your needs. A jeweler would be the best place to take it, and many jewelers will clean it for free. When you scrub your diamond jewelry, you need to make sure that you use a scrubber that is soft. Many people like to use a soft toothbrush or some other type of brush. Just be sure the bristles are soft and not hard. Your goal is to bring out the shine, and you don’t want to scratch up the gold or make it look funny. You can buy a brush specially designed for cleaning your jewelry from a jeweler or in a store. If you are not sure about how to clean your diamond jewelry and you want to be sure a professional does it the right way you can take it to just about any jeweler out there. Some will clean it for free, and others may have a small charge. The best part about it is that when you pick up your jewelry, it will look as new as it was the first day you wore it. This is because jewelers have machines they can put your jewelry in that will clean it for you. These machines work appropriately, and you can trust them. No jeweler would ever put your piece of jewelry in anything that would harm the piece. You can always trust the jeweler. In most cases, your diamond ring or another piece of jewelry will be ready within an hour of dropping it off. Ultrasonic cleaning is another way to clean diamond jewelry. There are many different ultrasonic cleaners on the market you can choose from if you want to clean your jewelry with the high tech machines the jewelers are using. These use a high frequency which results in a cleaning action. Always read instructions before putting any of your jewelry in a machine like this. Not all ultrasonic cleaners work the same way so be sure you know what you are doing before you put your jewelry in for cleaning. Taking proper care of your jewelry means you will take the time to clean it. If your jewelry doesn’t shine anymore like the day you first got it, you will need to clean it. You can always restore the shine of gold and diamonds. Make sure you bring your ring regularly (twice a year is ideal) to the jewelry shop to avail yourself of professional inspection and cleaning. Apart from cleaning and restoring back the brilliance of your gift, you can also take advantage of the procedure to know the condition of the stone and the prongs on your ring setting. Check out the jewelry shop where the ring was bought for discounts or special promos offered. Who knows, you may be lucky to get a free cleaning service included when your partner purchased your gift. Modern ways to clean your Diamond jewelry. There are some ready-made cleaning cloths available nowadays that you can use to both clean and polish your jewelry with ease. These cloths are typically treated with quality cleaning and polishing agents that will easily remove dirt and grime and bring back your jewelry’s original shine in only minutes. These cloths are ideal for a quick clean-up. If you are short of time just wipe off the piece with the treated inner cloth. It will loosen the tarnish, which then can be removed by wiping with the outer cotton fabric. However, don’t use the fabric cleaner on 24 karat gold and soft, porous gemstones like – pearl, opal, emerald, turquoise, amber, coral, and onyx. These delicate stones should be cleaned with a soapy solution and minimal contact. Many women nowadays also prefer to use an ultrasonic jewelry cleaner for thorough cleaning. These devices send high-frequency waves through a cleaning solution and are excellent for regular, thorough cleaning and are surprisingly affordable. 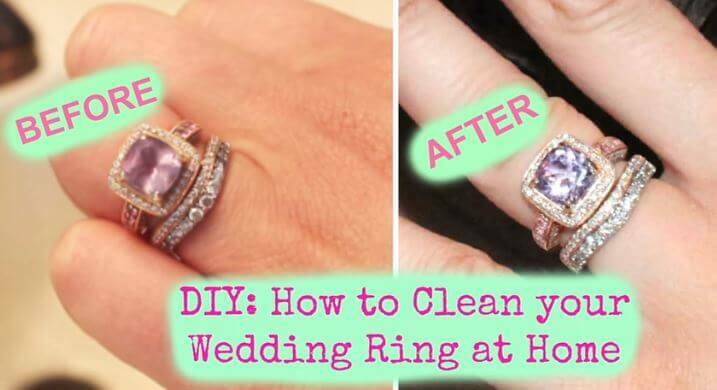 Home cleaning is only really suitable for a well-made and sound engagement ring. But if your well-made engagement ring is made from gold, white gold, rose gold or platinum with no stones other than diamonds, sapphires or rubies, it is easy to give it a good clean up at home, and it only takes a few minutes. In conclusion, the methods discussed in this article are based on experience from working with jewelry comprised of diverse materials. That being said, every situation is different, and if you are hesitant to clean your jewelry, consult a jeweler before risking damaging your jewelry.